Venus is the second planet from the Sun, and the most like Earth in terms of its mass (80% Earth’s) and size (95% Earth’s). In almost every other aspect it is radically different. It has a thick, carbon dioxide atmosphere, little water, a weak magnetic field, and a surface temperature of 740 K (860 F, 460 C). Despite this radical difference, early Venus was a wet world much like early Earth. 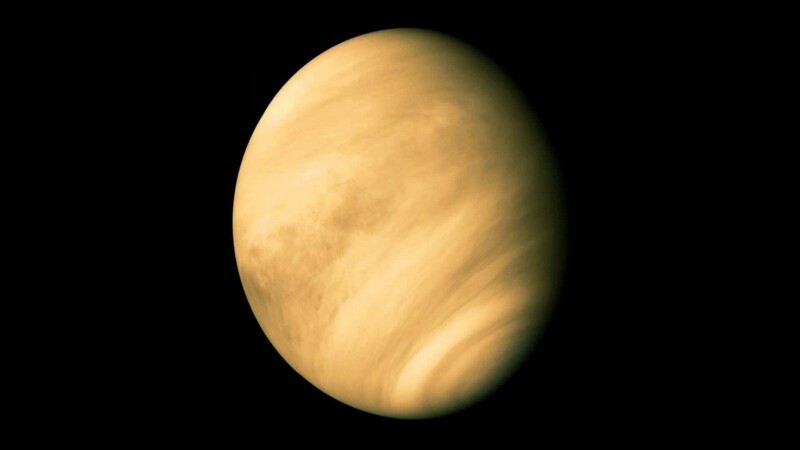 We know from the levels of hydrogen and deuterium in Venus’ atmosphere that it too had a wet past. But somehow Venus and Earth diverged. Surface of Venus taken by Venera 13. Venus was a watery world for its first hundred million years or so. Then, because of its proximity to the Sun, warmer temperatures caused more water vapor to enter the atmosphere. Because Venus’ weak magnetic field couldn’t protect the atmosphere from the solar wind, the water vapor was gradually photodissociated into hydrogen and oxygen. The hydrogen escaped the atmosphere, leaving the oxygen to bond with carbon to form carbon dioxide. This led to a runaway greenhouse effect, where rising carbon dioxide trapped more heat, causing more water vapor to enter the upper atmosphere, in turn leading to more carbon dioxide. Perhaps the most unusual aspect of Venus is the fact that it rotates backwards on its axis compared to the other planets (what we call retrograde rotation). On Venus you would see the Sun rise in the west and set in the East. It’s rotation is also very slow, taking about 243 Earth days to make a complete turn. However because of its retrograde rotation a day on Venus is only about 117 Earth days long. That means a year on Venus is a bit less than two days long. We’re not exactly sure why Venus rotates in a retrograde fashion, but one idea is that the planet was impacted by two large bodies about 10,000 years apart. Such a double impact could have given the planet its backward rotation while ensuring that any moons either escaped the planet or spiraled into it. The runaway greenhouse effect of early Venus is sometimes held up as a cautionary tale for the global warming of our own planet. Even Carl Sagan made such a comparison in his Cosmos series. But it is important to recognize that early Venus and modern Earth are very different. Global warming is a very real effect on Earth, and the evidence for anthropogenic greenhouse gases as a driving force of climate change is well documented. But there’s no indication of such a runaway effect occurring here on Earth.